Patrick Head said recently that it might be an idea for F1 to adopt reverse grids, with the fastest qualifiers at the back and the slowest car on pole. Max Mosley is said to favor a system whereby the drivers swap cars every race and so introduce a little spice into the equation. It is, perhaps, a measure of the desperation induced by the processional nature of many F1 races these days that such crazy solutions are suggested. The fact that there has even been some debate over them (all pointing out how silly the ideas are, fortunately) is a measure of the frustration amongst F1 fans in this area. Should we be thinking of alternatives to the age old system of fastest gets pole? My answer to that is a resounding no, but I am always prepared to take into account my old foginess - I am open to being persuaded. It was one of Fernando Alonso's recent comments that raised a point that has bugged me for a long time and led on to thoughts on this business of the grid. It was the unthinking acceptance that has greeted Alonso's statement that he always wants to be in the fastest car that got me going. Naturally, every driver wants the best car - it is a quick and easy route to winning races, after all. But, if we are concerned about the entertainment value of F1, it makes no sense to put the fastest drivers in the fastest cars. That is just ensuring that the race will be a procession. Would it not make for better racing if we were to somehow ensure that the best drivers had the worst cars and vice versa? Sort of an unholy marriage between Head's and Mosley's ideas. We could rate the cars and drivers according to points scored in the previous season and then assign the drivers to teams accordingly. Kimi and Fernando in Force Indias, Hamilton and Kovalainen in Super Aguris, that would be fun. Button and Barrichello might find themselves in some pretty competitive machinery for a change, Sutil could at last get his hands on a McLaren and Fisichella might find himself back with his old friend Flavio. Of course, for the first season, things would be a bit silly, as unregarded drivers suddenly proved that they had what it takes all along. But it might get Button the championship at last and the chaos would settle down in the second year. Then there are the teams to consider. How encouraging it would be for some of the no-hopers to occasionally taste the delights of success thanks to having a demon driver one year. Spread the happiness, that's what I say. Think of the strategic possibilities, too. As a team owner, do you go for the fastest design possible and hope that your duffer drivers manage to get to the front anyway? Or do you deliberately underperform to ensure you get the best driver next year? This is the kind of thing that Ross Brawn would thrive on - much more fun than trying to get the Honda team to work together. It is a better idea than others that have been suggested, anyway. Reverse grids, for instance, have been tried in other formulae and work well enough if all you want to see is some overtaking; as a system of rewarding the most deserving, however, it is a non-starter. At least my suggestion would throw everything into complete turmoil and make predicting the champion virtually impossible. But it is a lottery, much as the other solutions would be. As unfair as it is, the tried and tested method of fastest gets pole is the only one that works - if we want to preserve F1 as a serious form of motor sport, that is. The problem of processional races requires a good deal more thought than either Mr Head or Mr Mosley have given it so far, obviously. Let them go back to the drawing board and come up with something that has some concern for the sport this time. I think my head is going to explode if I have to write this same comment again. Max, you apparently read the blogs so read this and get your backside off your throne and implement it. It is midnumbingly simple so even you should be able to understand it. Since time began i.e. the British GP 1950 the fastest qualifier has started at the front and the slowest at the back. No-one complained until the early 80s. The reason no-one complained was until the late 70s/early 80s overtaking was relatively simple. Then aerodynamics became so sophisticated and front wings became so sensitive that it was impossible for one driver to follow another through a corner and get close enough to slipstream him down the straight and overtake. There used to be a website (still is for all I know) that listed the change of leader at the start line of every GP. It used to be common place at Monza for example to see 30 or 40 changes of leader. Nothing to do with pit stop chess just good wheel to wheel racing. Bear in mind these are only end of lap lead changes the genuine number of lead changes could be four or five times as many. Most circuits had the lead changing hand every 4 or 5 laps and by modern standards a huge number of drivers leading part of the race. I don't consider someone who delays their pit stop to lead a lap to be in the lead of a race. The aero got sophisticated, lap speeds went up, chicanes were installed and overtaking stopped. If the people running the FIA/CSI had two brain cells to rub together this would have set the alarm bells ringing but they couldn't hear the alarm over the complacency. Maybe your hearing is affected when your snout is in he trough. As with most of the problems relating to qualifying and racing the problem is the technical regs. We need to watch cars racing not hypersensitive low flying aircraft. So Max cut the aero, get rid of Tilke and find a modern Hugenholz. It is mindnumbingly simple like yourself. Of course Max will tell us that overtaking shouldn't be too easy. I wonder what other marvels he has along the same lines. Tyres shouldn't be too white perhaps. Bernie shouldn't be too poor. Ferrari shouldn't be discriminated against. Oh he has used that one already. Definitely the quote of the week: "(Max,) it is mindnumbingly simple like yourself." Of course, I agree, Steven, but fear our protests will fall on deaf ears as usual. Those in control of the sport have become convinced that it is a business and they must make it pay. And that means the show must get ever glitzier to draw the attention of the masses. In such an atmosphere, foolish suggestions like Patrick Head's can be made and taken seriously. So the solution is to cut the aero, maybe some other things to equalize performance, and redesign tracks to make passing easier?!? If you do that it might also bring F1 back to America. Wait, we already have that, it's called Nascar! Ah well, I remember when I first became an F1 fan in the 1970s, back then it was about technical innovation and improving the breed and a battle of wits between the likes of Colin Chapman and the other manufacturers. And even there were less 'secrets' we fans used to actually go into the paddock and watch the mechanics work on the cars out in the open. I've been increasingly dissapointed at the Nascarization of F1, and the silly notions of the FIA in the name of cost saving. Seems like these days more money is spent to get less. Come on, that "idea" can't be serious, is total nonsense! I bet that all the teams would leave F1 before anyone suggested it seriously. F1 is fine. We get nice racing, top of the line cars, mechanichal failures, great drivers, silly seasons, silly drivers. So overtaking happens less than it used to, so what? The cars are way more advanced and that is a logical development: more advanced equals less overtaking. Just turn and look at nascrap. I have been saying this for years: F1 is fine. Stop complaining nonsens. The only thing I would bring back are slicks, and the only things I would change is that stupid engine freeze rule (and all the green rules) and ban refueling. I, too, remember the days when one could wander the paddock unhindered, Rick. There is so much money involved now that I doubt we could ever go back to that, however. I am not unrealistic - it is a monumental task that the FIA have in guiding F1 into the future. Easy enough for us to sit back and give our pat answers. In fact, I don't believe Patrick Head was being serious about the reverse grid thing either. He has a habit of making the occasional outrageous statement, just to see how far the press run with it. And I agree with all you say about the way forward. If this was a joke, Max Mosley would think you're his fan. This is a variation on a plan he offered at the end of 2002 (yes, THAT season). He said that drivers should be assigned to teams based on championship points, albeit on a race-by-race basis. Sure, this was almost definitely a smokescreen to let his original, not-so-radical ideas through, but still, the very suggestion of it meant he was open to it. Over the last few years, Journeyer, I have realised that predicting Max Mosley is a mug's game. The man is so "out there" in his ideas that I can only presume that he borrows the FIA random penalty generator and sets it to "Unlikely Proposals", then gives it a spin. It terrifies me that he is in charge of F1's future. If Todt does in fact replace Max when his tenure is complete, then all the conspiracy between the FIA and Ferrari will be justified. This is an issue that can be debated on it's own. All these ideas to change F1 are ludicris to say the least. Steven has the only idea that actually may work. I fear that this will never happen because it makes sense. I also do not agree that everything is OK in F1. Changes need to be made or the sport will be the same everyweek. Two teams fighting it out for both championships. Patrick's idea did get us all talking. We need to make these cars be able to use each other. The slipstream is missing in F1 and I would like to get it back again! Anyone who thought watching Alonso in a Minardi was more exciting than watching him in a winning Renault or McLaren will love your idea, Clive. Oh blimey, don't say I've released a monster! I was joking, honest, and really want the grid selection to remain exactly as it is. Don't take the post seriously, anyone - it's utter nonsense, I assure you! I actually like your idea Clive, but more in the sense of a one off special exhibition race type thing, rather than a season. Maybe for charity or something? Certainly would be a spectacle ! Reverse grids? Cars chosen at random? Weight penalties? Sure, and at the next world cup, maybe Saudi Arabia and Paraguay should be allowed to shoot at bigger goal posts while Germany, Italy and Brazil have to aim at especially small ones. Maybe the fastest runners at the 100m at the Olympics should have to run 102m. Maybe Roger Federer should have to play with a wooden racket. These suggestions belong in the circus, not the top level of professional sport. Max. Are you listening? Not cost-effective, Peril - Bernie wouldn't hear of it! Hear, hear, Patrick. Although I doubt Max will. 18 comments already, Clive is probably wondering where is Number 38, he's got STRONG opinions on this subject. Reverse grids are used in some racing and random number grids also, I have personal experience in both, they do have the effect of adding excitment and drama. But that is too far ahead of F1 to be rationally considered. No, we like our fast cars in front and slow cars in the rear, we love the blue flag , and penalties, oh yes, we've got to have lots penalties to shuffle the grid and modify results. But doesn't that issue alone make my point, we can start fast cars from the back and still have good racing, wasn't it last year that Massa started from pit lane and finished 6th, last Sunday Hammy started 9th or 10th and nearly made the podium. I think we will never see reverse grids for several reasons, tradition being #1, the idea MadMax would foist it on us is of course repulsive, and frankly a bit of ignorance on our part. Rest assured, it's not going to happen but I would suggest you "don't knock it until you've tried it" ......................... I have, it works. I think I'll put you, Number 38, and Patrick in a room together with one rolled-up newspaper each and let you have at it! No gouging, punching or kicking, mind you - just whacks with the paper. It's quite simple. If you encourage slow lappery (as reverse grids do), then drivers will go as slowly as possible. 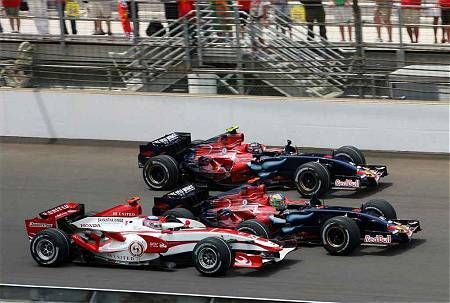 Exhibit A: British Grand Prix, first qualifying, 2004. A predicted rain shower in second qualifying meant that it looked like going out earlier was better. As a result, most drivers went as slowly as they dared with some spinning to further slow themselves down. Thankfully for lovers of fair play, the rain never came and those who played fairly were rewarded with unusually good grid slots come the race. Reverse grids are only more exciting if people don't try to manipulate them - Formula 1 is too full of manipulators for such a format to be left untouched. Good point, Alianora, and one we need to take into account when thinking of alternatives to present systems.